The kudo knife is a really great pocket knife really sharp and cuts really good. Although it is a little bit of a pain opening it and closing it. But after you do it for awhile you get use to it. 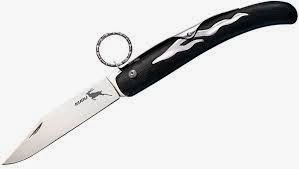 This knife is great if you are going hunting or fishing or anything. I feel safe carrying this knife around if I am going for a walk alone or with the kids and my husband can't come.